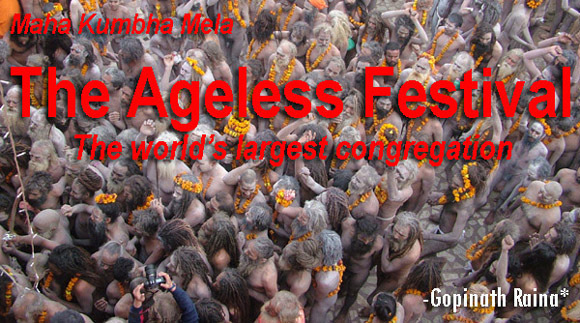 he millennia-old Kumbha Mela is the largest religious gathering on earth, according to the Guinness Book of World Records. It is quite unique not merely because of its sheer size but also for being a meeting both of the ascetics and the lay people. Holy men and women, saints and sages, who practice austerities in the remote caverns of the Himalayas and jungles, come out of seclusion only once every 12 years to attend the mela, bless the countless stream of pilgrims and share with them their knowledge and experience. Also, naga sadhus (naked monks), the heads of various sects, religious organizations and Mahamandaleshwars make it a point to be a part of the huge congregation. Indeed, a rare sight for millions of devout who feel greatly blessed by having darshan of the great souls! Lahiri Mahashay, the famed paramguru of Paramahamsa Yogananda, the world-renowned author of “Autobiography of a Yogi”, met his guru, Mahavatar Babaji at the Kumbha Mela only. While Christmas comes once every year, this ‘Ageless festival’ of India is held once in 12 years in each of the four different Indian cities, depending, of course, on the position of one of the nine planets, namely Jupiter, which takes as many years to complete the orbit of the stellar zodiac. The Kumbha Mela at Hari-dwar (literally meaning the ‘gateway to god’) in Uttaranchal is held when Jupiter is in the zodiac sign of Aquarius in juxtaposition to the Sun in Aries; the festival at Prayag in Allahabad takes place when Jupiter is in Taurus in juxtaposition to the Sun in Capricorn; the one at Nasik in Maharashtra is held when both Jupiter and the Sun are in Leo; and at Ujjain in Madhya Pradesh, it is held when Jupiter is in Libra in juxtaposition to the Sun in Aries. The four earthly sites, according to the Hindu mythological lore, received drops of the amrit (divine ambrosia) which was obtained by churning Ksheer Saagar (the primeval ocean of milk) in the wake of continuing battle between the gods and the demons. The war between the gods and the demons (forces of good and evil) goes on perpetually. It is said that while the demons would win the battles, it is the gods who ultimately won the wars, thanks to divine support. One such war took place at the beginning of the creation, in which gods, as expected, were defeated. They approached Brahma, the Creator, for a remedy. He sent them to Bhagawan Vishnu who advised them to churn the ocean, the repository of limitless wealth and take out amrit. Anyone who had a sip of amrit would become immortal. In this stupendous task, the gods sought the cooperation of the demons who agreed on the condition that they would share the countless treasures that the ocean would yield. 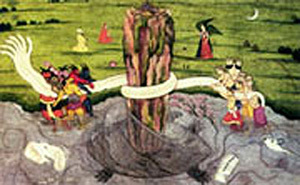 With Mount Meru as the post and the Sheshnaag, the serpent on which Lord Vishnu lies, as the churning rope, both the gods and the demons set about their task. As the churning continued, the first substances to be released were deadly fumes and gases (Kaalakoot Vish) which Lord Siva consumed to save the world from certain death. The poisonous substance turned Siva’s throat blue and resulted in His being called Neelakantha. After many rounds of churning, the ocean yielded a number of ratnas (jewels), the last of which was Dhanavantari, the great healer who held in his hands the Kumbha (pitcher) of ambrosia. Both the gods and the demons made a dash for the prize item. The battle for acquiring the pitcher of amrit went on for twelve consecutive days and nights, which was equivalent to 12 human years. At this point of time, Lord Vishnu appeared disguised as Mohini, a damsel of great enchanting beauty. Infatuated by Mohini’s charm, the two parties accepted her as the right person to distribute amrit. She seated gods and the demons in separate rows and began with the gods first. Rahu, a demon, sneaked into the gods’ row. The Sun and the Moon sitting on either side complained to Lord Vishnu who chopped off Rahu’s head with His Sudarshan Chakra. But the demon did not die as he had taken amrit. It is since then that the two parts of the demon, Rahu (dragon’s head) and Ketu (dragon’s tail) cause eclipses of the Sun and the Moon, their old enemies by virtue of playing the role of informers. Meanwhile, Jayant, the son of Indra fled with the pitcher containing amrit with the demons in hot pursuit after him. In the resultant melee, drops of the divine ambrosia splashed at the four earthly sites: Har Ki Pauri at (Hari-dwar); Triveni Sangam (Allahabad); Nasik (Maharashtra) and Ujjain (Madhya Pradesh). As only a few drops of amrit fell at the last two places, smaller Kumbha festivals are held there. In this divine drama, three actors were actively involved. 1) Brihaspati (Jupiter), the preceptor of gods, whose wisdom saved amrit; 2) Surya (Sun), whose rays turned the raw pitcher into a solid one and 3) Chandra (Moon), the main informer of Rahu’s action. The three-some determine the occurrence of what has come to be known as the Kumbha Mela. The position of Jupiter in the stellar zodiac fixes the year, the placement of the Sun fixes the month and the position of Moon fixes the tithi (the lunar day) of the festival. The pilgrimage to the sacred rivers is believed to exist in India for nearly 10,000 years. Megasthenes, the 4th century BCE Greek visitor to India has recorded a description of what could have been the Kumbha Mela. However, the first direct reference to the festival has been made by the Chinese traveler, Hieun Tsang who visited India from 629 to 645 CE during the reign of the great King, Harshavardhana. According to him, even though the origin of the Kumbha was lost in antiquity, the festival at that time was known as several thousand years old. Hieun Tsang says that King Harshavardhana attended every Kumbha held during his time. Thus one can safely assume that Kumbha Mela has been there almost since the existence of our perennial civilization and culture. And this chain extending to the hoary past has never been broken. Even though journey in good old days must have been hazardous with primitive transport and roads infested with robbers and beasts, hundreds and thousands of pilgrims would converge on the Kumbha mela. 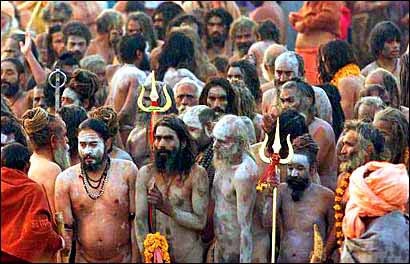 Over 15 million Hindus from all over the world are expected to take a dip in the holy Ganges during the current Kumbha Mela being held at Haridwar from January 14 to April 28, 2010, the second largest in the new millennium. 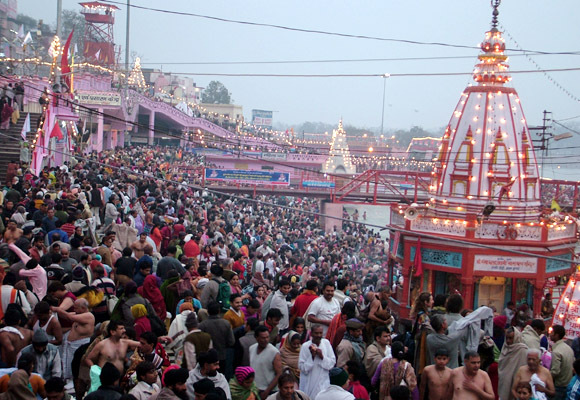 The previous festival held at the same venue in 1998 managed about 10 million pilgrims. Even then, this figure was five times the 2 million pilgrims who journeyed to Mecca for the Haj the same year. This was the first of the big bathing days, considered very auspicious in view of the entry of the Sun in the zodiac sign of Capricorn. For holy men and women this was the main bathing day where they participated in gilded and naked processions. It was also the day when new members of various monastic orders receive their first initiation. This was the fifth day of the bright half of the lunar month and was the beginning of spring in North India-a day when people pray for a good bumper harvest. Traditionally people wear yellow on this day. This was the full moon in the lunar month of Magha (Jan- Feb). This was the great night of Shiva from whose locks the Ganges flows. He married Parvati, daughter of the Himalayas, on this day. The no-moon day on a Monday is held as very auspicious, equivalent to the auspiciousness of a solar eclipse. On this day, worship, japa, or meditation is believed to receive exceptional spiritual benediction. The benefits of taking a holy dip, performance of charitable acts and Shraddha (giving oblations in the name of manes) and observance of vow of silence on this day are considered perennial and everlasting. The day marked the birth of Lord Rama,. The full moon day of the lunar month of Chaitra month is particularly sacred to the Chitra Guptas, the recording angels of the Hindu pantheon. A special worship is offered to these celestial representatives of the god of death, and an offering of spiced rice is prepared and later distributed as prasad or holy sacrament. The day also marked the birthday of Hanumanji, who symbolizes strength, unparalleled devotion, and selfless service. This full moon day is the last auspicious bathing date of Kumbha Mela 2010. Satyanarayana Swamy Vratam is observed and Vishnu Pujas are performed on this day. The day also marks three major events in the life of Lord Buddha-his birth, enlightenment and death. 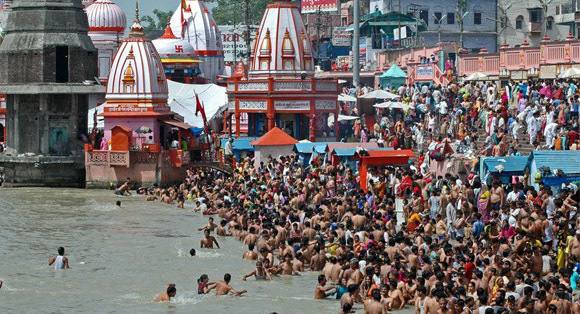 There is a popular belief held since ancient times that a dip at Har-ki-Pauri and other towns along the 1250-mile journey of the holy Ganges river from the Himalayas to the Bay of Benal, particularly during the Kumbha, washes away their sins and bestows great spiritual benefits. A Rig Vedic hymn goes a step further and says that “those who come to discard their bodies at the confluence of the white and blue waters achieve immortality.” In Mahabharata, sage Pulastya tells the grandsire, Bhishma, that “the pilgrim who bathes at the confluence of the Ganga and the Yamuna wins absolution for his entire family and that anyone, who may have perpetrated a hundred crimes, is redeemed the moment he/she touches the waters at the Triveni.” Our scriptures even equate the benefit of participating in the Kumbha to that obtained from the performance of Ashwamedha Yagnya (horse sacrifice). Yet another belief held by the devout is that about 350 million gods and 88,000 rishis attend the Kumbha Mela and a few of these angelic beings are carried in a mystical sense in the form of Gangajal by each pilgrim and placed in their altars in their homes. In this way, the blessings of the pilgrimage are extended months, even years, beyond the actual event. The Hindus have thus maintained their spiritual traditions, thanks to such unifiers at the Kumbha which bring millions of pilgrims together, thus forging emotional unity amongst the vast heterogeneous population. In Hinduism, unlike the Srutis (revealed scriptures such as the Vedas), the Smritis, the codes of law and conduct which govern Hindu society, are meant to be adjusted to suit the changing times and circumstances. The congregations like the Kumbha where all the religious heads and top spiritual leaders get together serve not only to revitalize but also give new directions, infuse fresh lease of life and update religious concepts, practices and rites that could be getting out of tune with the changing times. Adi Shankara, the greatest Indian philosopher and religious reformer of the 8th century, attached lot of importance to festivals like the Kumbha. He exhorted holy men to meet on such occasions for a free exchange of views on religious matters and save the system from senility and decline. The unique congregation of millions at the Kumbha festivals proves beyond doubt that for Hindus the ideal of spirituality as the goal of life shines forth as brightly even today as it did seven thousand years ago. In fact, the continuing stability with subtle changes in the idiom and the emphasis on various spiritual matters has been the secret of the staying power of the ancient Hindu culture and civilization. A well researched and very informative article on Maha Kumbh Mela Rainaji. Dear Raina Ji, A wonderful article,for developing spiritual tourism in India. Editor Shehjar has developed this write-up with the beautiful images. 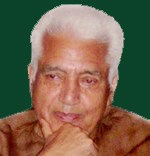 Editor Sajth---South Asian Journal for Tourism and Heritage. Indeed a very informative and interesting article. Great accompanying images help in understanding the scope and grandeur of the event. Thank you. 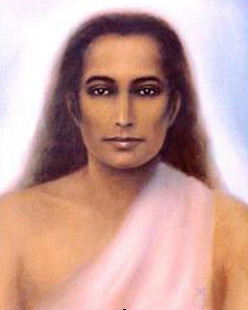 Yet another source, http://en.wikipedia.org/wiki/Mahavatar_Babaji, points out that the first reported encounter of Lahiri Mahasaya with Babaji was in 1861 when the former was posted in Ranikhet as an accountant for the British government. While walking in the hills one day, Lahiri Mahasaya heard a voice calling his name. Following the voice up the mountain, he met what he described as tall, divinely radiant Sadhu, who reportedly told him that he was his guru from the past.